50 States, 50 Days of Action for Peace, Protection, and Justice for Sudan Grassroots groups and Darfuris across the nation have joined together to say: No support for sham elections in Sudan! Beginning February 20th, for the 50 days leading up to the April 2010 election, regular citizens in every state will take targeted and effective action to say, we do not support elections that will legitimize an indicted war criminal. Under the current climate of violence and political intimidation, the Sudanese elections (scheduled for April 11, 2010) will be anything but free and fair. With insecurity continuing in Darfur and violence mounting in the South, fraudulent elections in April could be a dangerous flashpoint for Sudan. Darfuris living in IDP and refugee camps and the Diaspora are boycotting upcoming elections. These elections will do nothing but legitimize the engineers of the first genocide in the 21st century. 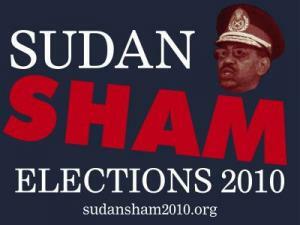 Join us in the Sudan Sham Elections 2010 Campaign. Each state will organize one day of action. Actions will be easy and available for everyone in the state to take, yet targeted and effective. Our grassroots actions will support high-level advocacy campaigns by the national groups: Enough, Save Darfur, and Genocide Intervention Network. Actions will urge our government not to legitimize a war criminal’s reign through elections built around violence, intimidation, and coercion. Join this national, grassroots campaign! 2. Find your state on the map – contact the leader to get involved locally. 3. If your state doesn’t yet have a leader, sign up! We need all 50 states represented for success. 4. Tell 3 friends about the upcoming campaign. We are regular citizens around the 50 United States and DC, standing with the people of Sudan—the marginalized, the disenfranchised, and the brutally oppressed—in demanding truth and strength. An indicted war criminal, responsible for millions of deaths, will never be a legitimate leader. Peace, protection, and justice will come from strength in effort and conviction from our leaders. We are still looking for leaders to help reach out to several states. Contact Katie-Jay Scott, ktj[at]stopgenocidenow.org to get involved!